This evening I made a simple meal that turned out great. It's another ridiculously easy meal using ingredients that are easy to find anywhere and also simple to make. I made a Cheesy Beef & Cabbage Bake. It begins in a large skillet and ends in a casserole dish, although if you wanted to, you could prepare it in a large oven safe skillet and just pop it into the oven to finish up. 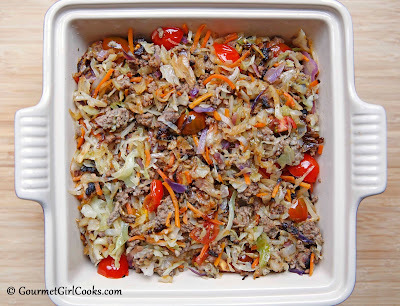 I browned ground beef and onions in a bit of butter and then added a bag of coleslaw mix and cooked it down, seasoned it with salt and pepper, added a bit more butter and then stirred in about a cup of diced fresh tomatoes then moved it over to a casserole dish, topped it with cheese and baked it for about 15 minutes and ran under the broiler for a few more until the cheese was melted and bubbly. 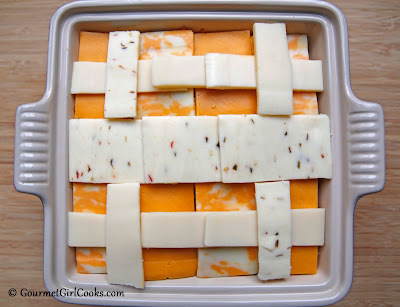 I happened to have several types of sliced cheese that I used a medley of (Swiss, Cheddar, Pepper Jack, and Colby Jack) but you can keep it simple and top it with shredded cheese or whatever you have on hand. That's it. It turned out delicious and uses very few ingredients. 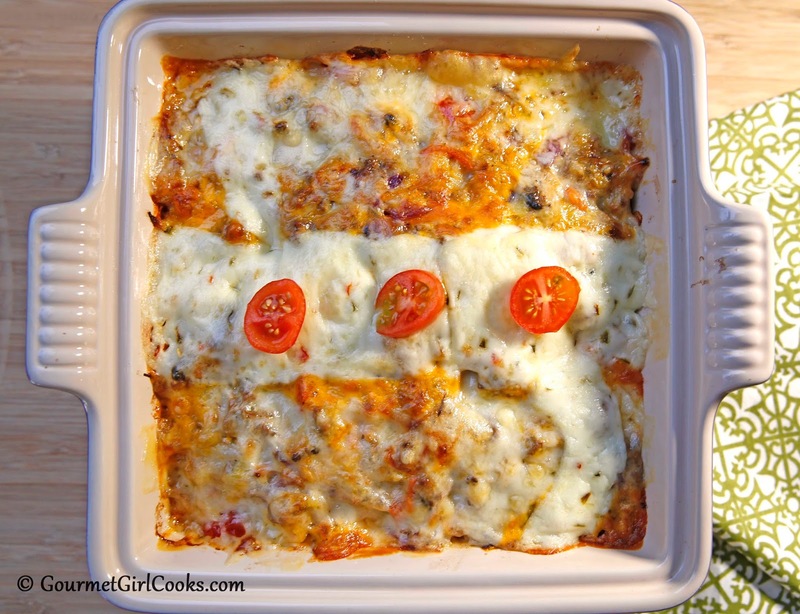 I snapped a few photos below and included the easy peasy cheesy recipe. Enjoy! Preheat oven to 350 degree F. Lightly grease a 9" x 13" oblong or oval casserole dish and set aside. 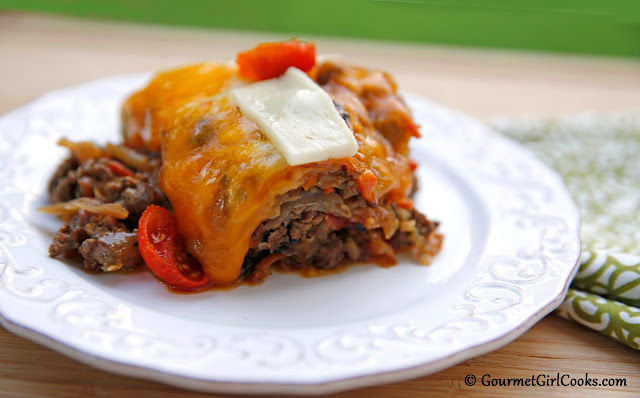 In a large skillet, brown ground beef and onion in 1 tablespoon butter over medium-high heat. 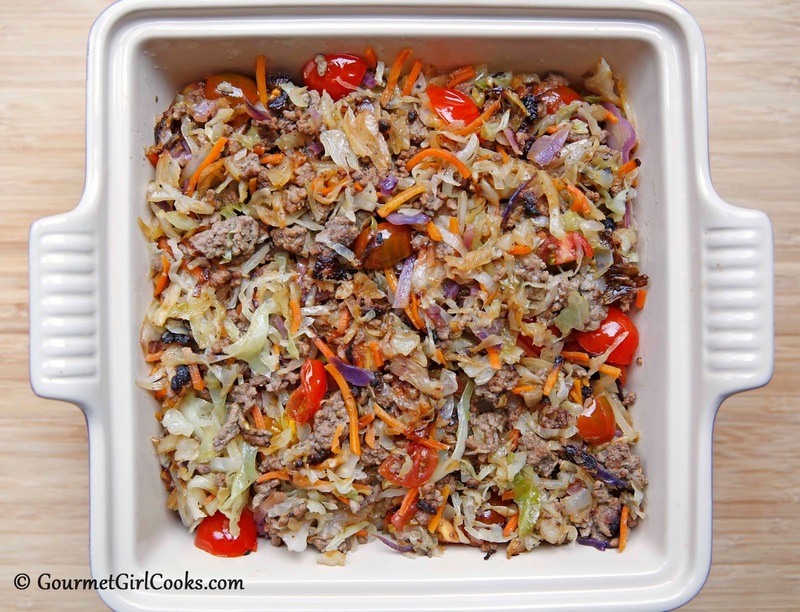 Add coleslaw mix and 1/4 cup water; cover skillet and cook, stirring occasionally until cabbage is tender-crisp or desired consistency, Uncover and add butter; season with salt and pepper. Stir in diced tomatoes and cook uncovered for another 5 minutes. Transfer beef and cabbage mixture to prepared casserole dish. Top with cheese and bake for 15 minutes, or until cheese is melted. If desired, run under the broiler for a few minutes until cheese is bubbly. Let sit for about 10 minutes before serving to allow cheese to set. Looks good!! Your dish looks like an 8x8 size. The recipe says 13x9. I just knew it wasn't a 13x9. Ha!!! We enjoyed this yummy dish yesterday for supper and had some of the leftovers for lunch today. We decided to try a little sour cream to garnish our servings and it was really nice that way, too. Your parmesan biscuits went really great with it, as well. It's been feast or famine this year, hasn't it. We've hardly had any rain at all. The sky has at times clouded up and we've even had thunder and lightning but it all passes over with hardly a drop falling on us. Other surrounding areas have had lots, if not too much, rain. Farmers always seem to get their crops planted and harvested, though. Although right around here they could use more rain, for sure. Oh, it looks like our egg lady is looking to sell her chickens! Her sign has been up for a couple of weeks (with presumably no takers yet.) Before long, we may need to find a new source for our beautiful, fresh eggs.